Professionals are always looking for new “customers”. To attract them, they need to create an atmosphere, or a draw where, when done correctly, clients, patients, etc… will find their “wares” superior to that of their competition and “buy” from them. They don’t have the good fortune (like schools) of being the only game in town and having an exclusive on their particular “product” so they need to do this advertising on a regular basis, even after they become established. Advertising or marketing is the lifeblood of any professional practice and I still miss the excitement of promoting the promise of good health to prospective patients and having them receive the positive benefits. Teaching has something just as special that we need to start “marketing” better. So how do we do this? Maybe the “Free Chicken Dinner” is just the solution. Free chicken dinners work on the “build it and they will come” philosophy. People love food and one tenet of marketing is that if you want people to support you – feed them! 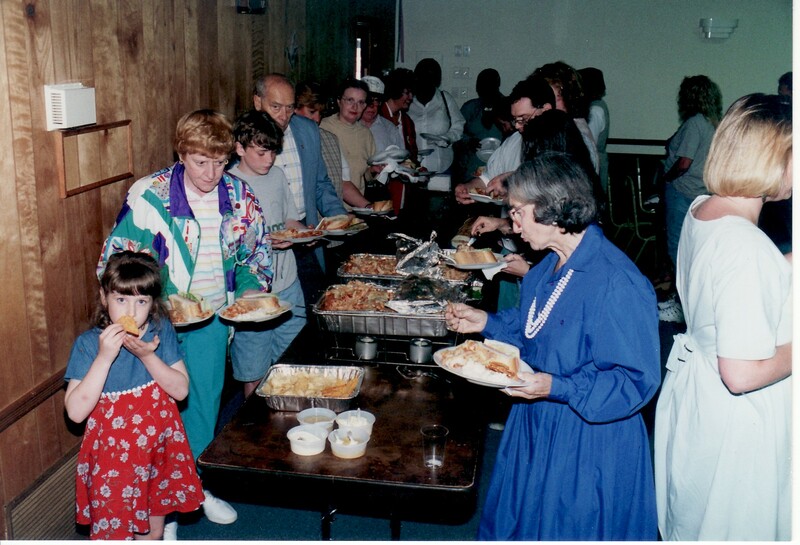 The idea of free chicken dinners goes back to churches having Sunday picnics to help foster a sense of community. While the local pastor might not admit it – or even be aware of it – he was selling religion at these get-togethers. Believe it or not, religion and business go together. So does health care and business. So does law and business. So does every other profession out there. So what about education? I can hear it already, “Oh no, we are not a business. We educate young minds.” Sorry to break this to all non-believers, but if we can market religion, we can – and should – market education. So grow up, and get with the program! This is NOT a “pot luck” event. It is also NOT a Parent/Teacher Conference. It IS a time to update parents on what is happening in school. 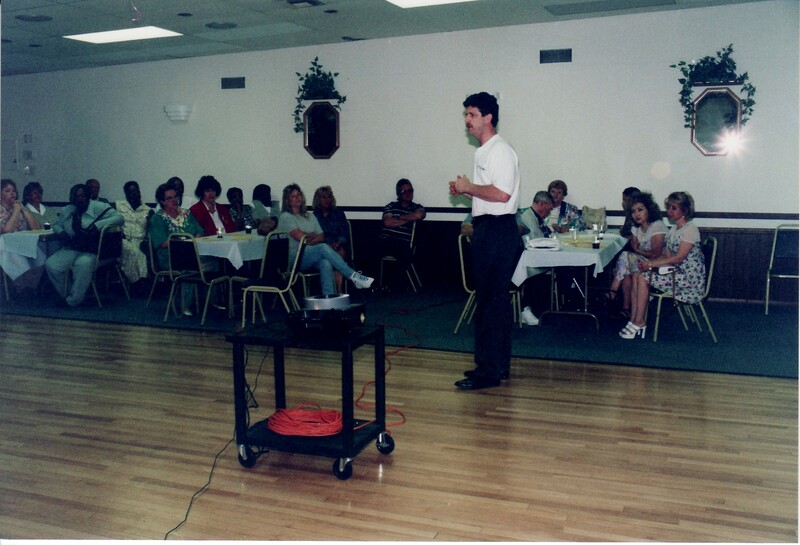 Included here are actual pictures when I was packing the VFW 15 years ago with 90+ patients and guests every month. I started in a Chinese restaurant conference room and grew. For the investment of a few trays of food and half an hour of talking, the goodwill you will receive in return is priceless. Invite parents with a guest (family member, spouse, neighbor, friend, etc….) so that they will have someone to speak with after they leave. And trust me, they will say nothing bad, everything good, and your school’s “stock value” will soar. It won’t matter if their children don’t attend your school. Start out with some school stats, then new developments and then onto upcoming events. The talk should last no more than 1/2 hour. Then everybody eats. As they are sitting and eating, the principal and A.P. or deans walk around – mingle like a wedding reception – asking questions, and getting feedback. Wrap up is fairly quick. Let them know when the next “dinner” will be and thank them for coming. If you know who is going to be there, you might be able to give them an up-to-date progress report of all their child’s classes (JupiterGrades does this wonderfully) and any other materials in an inexpensive Staples folder. No follow-up is done. No questionnaire. No phone calls. This is a “no strings” affair and you want to give parents a certain degree of responsibility. Let them make the first move. There should be some way of contacting them before the next dinner, and text/e-mail is a natural. The event is informal for the guests, but not “un-scripted” or casual for the presenter. He or she should be fully prepared and professional – humorous, but not weak. This is a time to show what you have to offer. You are representing every teacher and staff member in the school, but at the same time you are showing them the person who has the buck stop on his or her desk. Think of it as “marketing” your school, rather than being an administrator. You still have enough time to pull a couple of these together before June, but you might want to start planning now for next year. If I can be of assistance, let me know. Next item on the list? How about a “Parent Appreciation Week”? Details to follow!